Great new for the animals in Pennsylvania! Libre’s Law (Animal Abuse Statue Overhaul) was signed into law on Wednesday, June 28, 2017, in Harrisburg, PA. Libre even got to put his paw print on it. Libre is a Boston Terrier puppy who was found on near death on a farm near Lancaster, Pennsylvania. A produce truck driver rescued Libre on July 4, 2016, after seeing the 4-month-old puppy deteriorate over a period of weeks while caged outdoors on an Amish farm. Libre was emaciated, dehydrated and suffering from a severe skin infection. He was taken to Speranza Animal Rescue, who made sure that he got the veterinary care he so desperately needed. Luckily, he was rescued in time and has since made a full recovery. He’s become a spokes dog for the abuse animals in Pennsylvania. Libre, the neglected puppy that Libre’s Law is named for. Before and after his rescue and recovery. Susan Martin, the director, she has since stepped down, of the Lancaster County SPCA, decided not to pursue charges against Libre’s abusers, the owners of the farm. A summary citation against the farm owner, for the maximum allowable penalty, was filed by the district attorney. So the only punishment that Libre’s abusers got was a $900+ fine. About the equivalent of a traffic ticket, due to the animal cruelty code that was originally drafted in 1983. 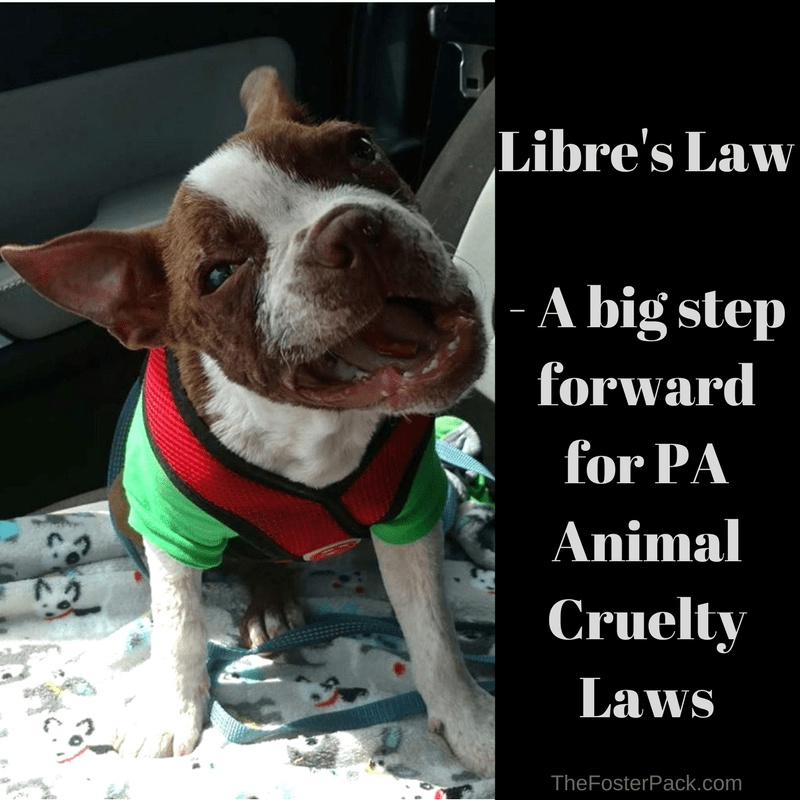 So what does Libre’s Law mean for the animals of Pennsylvania? Tethering: Dogs can no longer be chained out 24 hours a day! They can only be tethered out for 9 hours out of any 24 hour period. The tether must also be at least three times the length of the dog, and cannot be a log or tow chain. In weather above 90 degrees, or below 32 degrees, dogs can’t be chained out for more than 30 minutes. Chained dogs must also have access to water and shade at all times. Stiffer penalties: Libre’s Law stiffens the penalties for animal cruelty, up to felony charges, even for first-time offenders. It also breaks down the penalties for different grades of cruelty based on the offense, and how many prior offenses. Cases of horse abuse will now be treated the same as that of cats, dogs, and other family pets, under the new a section of the new legislation, called Cordelia’s Law, named after a starved horse. Immunity: Libre’s Law also gives immunity to Human Society Police Officers and Veterinarians. HSPOs and Vets can now report suspected cases of cruelty without the possibility of being sued if they’re wrong. Forfeiture: Libre’s Law states that anyone convicted of a misdemeanor or felony animal cruelty must forfeit their animals. Video of Libre putting his stamp of approval on Libre’s Law.